BowlerStudio Project ideas for implementing new features. This tutorial explores some of the features of BowlerStudio. 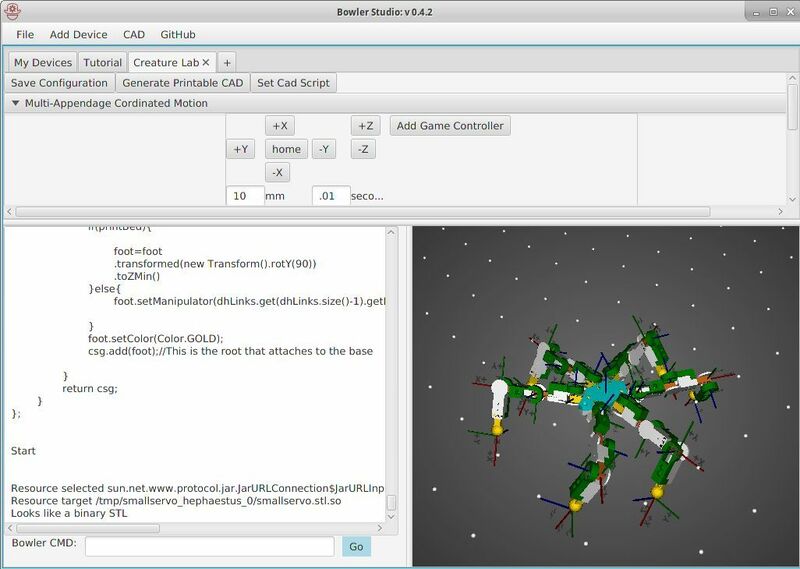 BowlerStudio CAD engine using Java to create solid geometry. So, You bought a DyIO and want to know how to get started? This tutorial will get you set up and coding on mac, windows, and Linux. BowlerStudio can simulate parts and assemblies in a physics engine. BowlerStudio can even connect to your camera and detect faces. BowlerStudio's MobileBase gives you control of walking, limbs and links. BowlerStudio can connect to lots of different kinds of hardware, this tutorial will show you how. Learn about the Binary RPC based protocol your computer and bowler devices use communicate with each-other. A simple tutorial teaching the basics of java programming. General kinematics and BowlerStudio Kinematics engine tutorial. A tutorial for bringing up ROS in BowlerStudio. A tutorial for interfacing with wAlnutAI library. A tutotial for implementing a new Bowler device on microcontrollers and in Java/Groovy to send and receive data from java to hardware and back.